Background: This translation is from an article originally published by 21st Century Economics (Guangzhou) on August 2nd, 2015, the source of which is a Chinese stockbroker research report. By mid-June, fearful of unsustainable margin lending precipitating a stockmarket collapse which could wipe out millions of household savings, there were rumours the government was looking to ‘let some air’ out of the market. This research report cites the vicious cycle of falling prices and margin calls as the cause, and that the main purpose of the government rescue is to reduce market volatility, not to prop-up the index. From the middle of June to the beginning of July, the A-share market experienced steep falls. Under the vigorous efforts to save the stockmarket, trade volatility decreased by mid-July. Yet on 27th July, A-shares fell by 8.5% in one day, the largest one day fall in 8 years, which led the market to worry that market rescue efforts had failed. However measuring the success of the market rescue lies not with how high the stockmarket index is, but rather whether margin financing has fallen to more reasonable levels. Because “controlling and separating margin trading risks” is the original purpose of this stockmarket rescue. Even though at the start of July rescue efforts centered on “stabilising share prices”, the goal was not to lift prices. 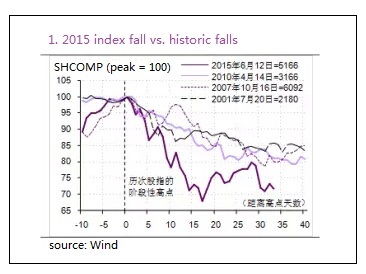 Over June and July, the Shanghai Composite Index had only fallen by 30%. In the past the A-shares had experienced far greater falls, falling by 70% between 2007 and 2008. During these previous falls, the government did not implement such desperate measures to save the market. So the current situation for A-shares is different to that in the past, because now there are large amounts of margin financing (leveraged funds from borrowing money to trade stocks), which has created two serious consequences: Firstly, when share prices are falling, margin account holdings are liquidated by the brokers, which creates a vicious cycle intertwined with the falling stock index, causing the stockmarket to fall even quicker. Although this time the stock index falls were not the largest, they were much quicker than previous historic falls (see graph 1). Secondly, such was the speed of the price falls, it’s possible that brokers were unable to liquidate client’s holdings, which meant clients were unable to payback their margin losses. This in turn meant that brokers and banks, as the main sources of margin financing, were facing bad loan risks. In this case, stockmarket volatility risk had spread to stockbroker’s and bank’s balance sheets, threatening financial system stability. Therefore in the short term, the government intervened in the market to break this vicious cycle, and prevent risk from spreading to financial institutions. In the long term, intervention is designed to reduce the overall level of margin financing, diffusing a time bomb. Thus the key standard by which to judge the success or failure of the stockmarket intervention is to consider whether or not margin financing has fallen to more reasonable levels. Achieving this aim does not depend on the index levels being high or low, but rather stabilising the index in order to prevent the concentration of risk bubbling over a critical point. At times when margin financing stages a comeback, it is still necessary to supress the index, and cool down leverage. So it is not necessary, nor should it be the case, that the stockmarket rescue supports the index above a certain level. From July 16th to 23rd, A-shares climbed back over six trading days, but at the same time, the amount of outstanding margin financing increased by 35.5 billion yuan. This revealed that that speculators were still present, and that any stockmarket recovery easily attracted leveraged funds, raising overall risk in the market. In an effort to reduce the scope of margin financing, the market rescue must not concentrate solely on lifting the index, but now and again allow for market falls. During those times, the stockmarket rescue “national team” need only to occasionally apply the brakes, and prevent panic taking hold and causing a market crash. From this point of view, the huge drop on July 27th “cooled down margin trades”, after which, the scale of margin financing began to fall. The July 27th fall could also be viewed as a “test of market stability”. The fall showed that market stability remains weak, as the vicious cycle of price falls and account liquidations made a comeback. Therefore, although the amount of margin trading has fallen by a decent amount, the risk it brings has yet to dissipate. Taking another comparison, present levels of A-share margin financing are still clearly far above the international average. 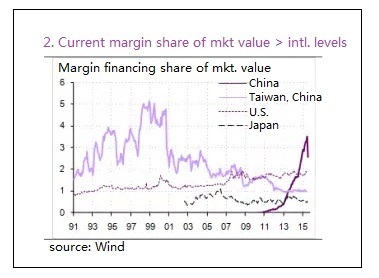 Currently, the amount of margin financing as a share of total market value stands at 2.5%, which is more than levels in the U.S., Japan and Taiwan, China (respectively 1.9%, 0.5% & 1.0%). If the ratio of margin to market value in A-shares was to reduce to the international average, then today’s outstanding margin financing amount of 1.4 trillion yuan would need to fall by at least 500 billion yuan. Considering that the A-share market still has room for falls, then an even greater reduction in margin financing levels would be required. (see graph 2). (Article not to be copied without permission).